This past weekend was spent baking non stop. I was mostly testing new recipes for the upcoming holidays. Now don’t get me wrong, I do love my sweets but after a while the sugar really gets to you! 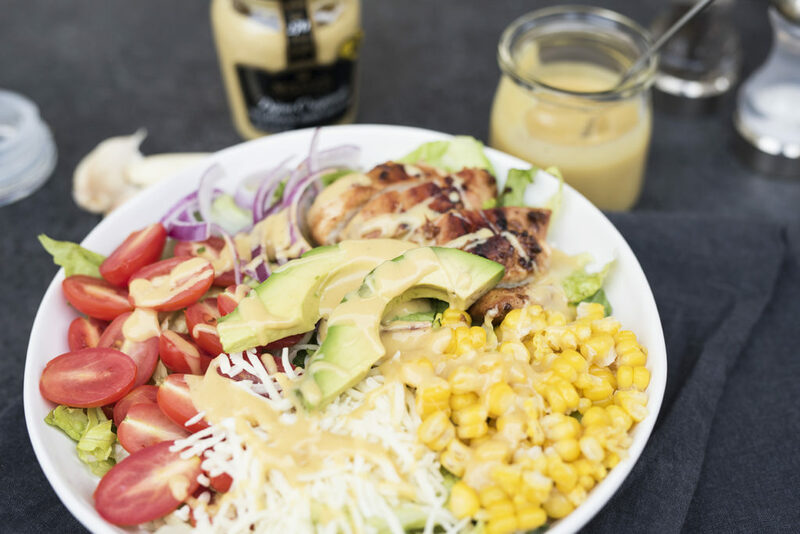 I wanted to start my week on the right foot by eating something light and healthy so I decided to throw together a quick salad with my favorite honey mustard dressing! I also used the dressing to glaze the chicken which turned out delicious! I also made this dressing ahead of time and just stored it in the fridge which made whipping up this lunch time salad even easier! 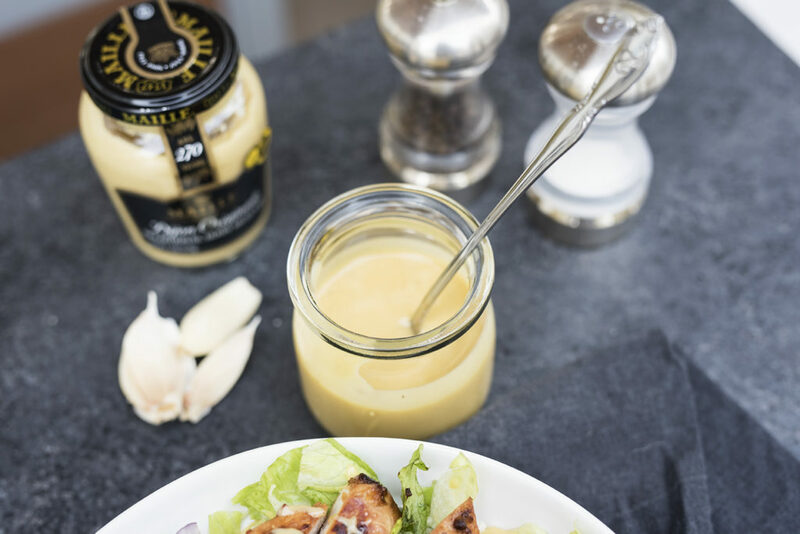 For the dressing, I used the following ingredients: garlic, white wine vinegar, Maille dijon mustard, mayo, raw honey, shallot, olive oil, and salt/pepper to taste. 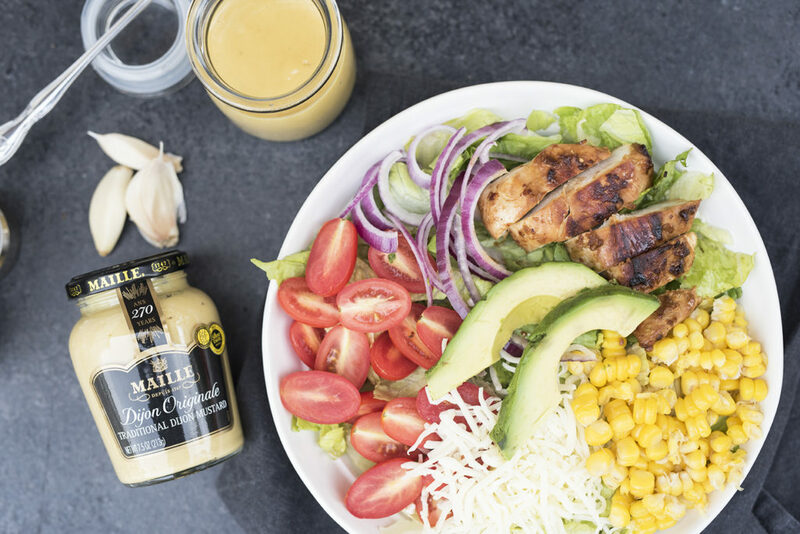 All you have to do is toss the ingredients in a mini food processor or blend and a creamy, tangy dressing is ready within seconds! I could also imagine this being used as a marinade for dinner dishes too. 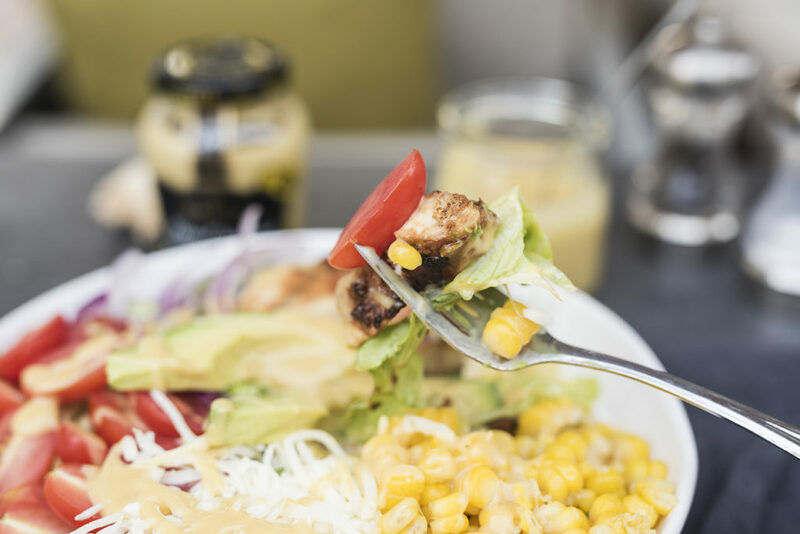 The recipe below makes approximately 1 1/2 cups dressing which was more than enough to coat the chicken and drizzle on my salad. The remainder can be stored in the fridge for next time! For my salad, I decided to pile my bowl high with grape tomatoes, red onion, corn, avocado, and a littttle bit of shredded mozzarella! 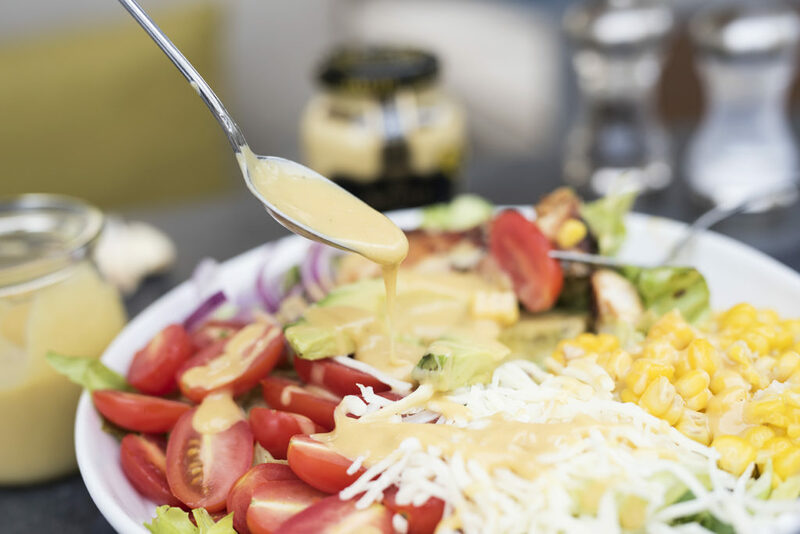 What’s your favorite simple salad dressing? 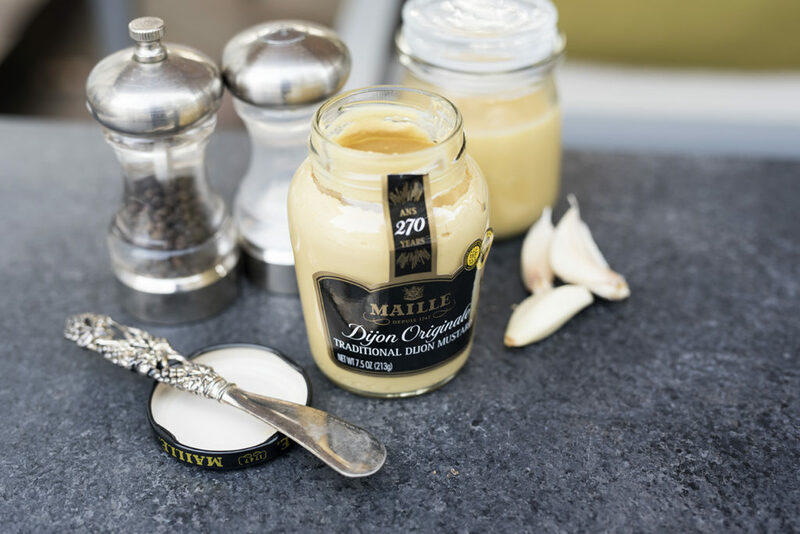 Place the garlic, vinegar, dijon mustard, mayo, honey, shallot, olive oil, and salt/pepper in a small food processor. Process until you have a smooth and creamy consistency. Strain the dressing through a small sieve into a mason jar or bowl. This will help remove any large chunks of shallot that were not full processed. Store dressing in a sealed jar or container until ready to use. Marinate the chicken. 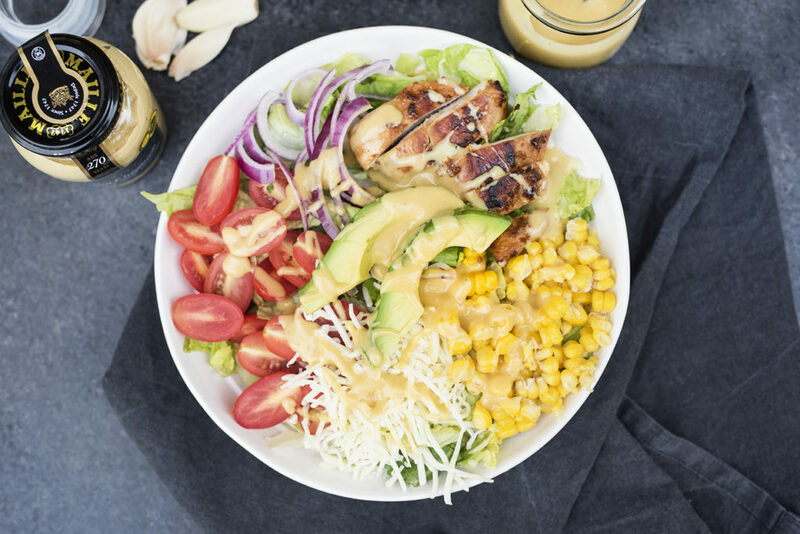 In a small bowl and the chicken breast and two tablespoons of the honey mustard dressing. Heat a small skillet on medium high heat and add a small amount of cooking oil. Place the chicken on the skillet and cook 4-5 minutes on each side or until the chicken is full cooked through. Once cooked, remove from pan and set aside to rest. Prepare the salad. Rinse and dry lettuce. Place lettuce in a large bowl with grape tomatoes, raw red onion, shredded mozzarella, avocado, and corn. Drizzle with desired amount of dressing and enjoy!